What a feminine delight! This delicate lace dress comes in two pastel colours to amp up your sweetness charm. Available in peach and powder blue, wear any of these dresses when leading up to the new year to stay in the festive mood. The dresses also serve as post-CNY outfits when you are ready to get back to work. Also available in Blush and in XS/S/M/L/XL. It’s sunny all year round, but that doesn’t mean we can’t enjoy seasonal delights! It’s finally spring again and we can kiss gloomy weathers farewell. Brighten up your wardrobe with this cheeky floral shift dress. Shift dresses are great for easy breezy and laid back days. We see a vacation in sight! Also available in Cream in XS/S/M/L/XL. Rompers are as equally as stylish as dresses. Get this halter neck crochet romper for the festive season! Comes in both bold and muted colours so it will definitely cater to people of different styles.Also available in Red / Navy and in XS/S/M/L. Rompers are as equally as stylish as dresses. Get this halter neck crochet romper for the festive season! Comes in both bold and muted colours so it will definitely cater to people of different styles.Also available in Red / Magenta and in XS/S/M/L. Rompers are as equally as stylish as dresses. Get this halter neck crochet romper for the festive season! Comes in both bold and muted colours so it will definitely cater to people of different styles.Also available in Navy / Magenta and in XS/S/M/L. This maxi dress is designed in luxurious satin-like material and features a mesh bodice for a sultry vibe. It's demure, yet daring at thea same time. The open back and the mesh sleeves further make a serious fashion statement. Perfect for dinner dates, wedding functions and formal functions.Also available in Red / Navy and in XS/S/M/L/XL. This maxi dress is designed in luxurious satin-like material and features a mesh bodice for a sultry vibe. It's demure, yet daring at thea same time. The open back and the mesh sleeves further make a serious fashion statement. Perfect for dinner dates, wedding functions and formal functions.Also available in Red / Black and in XS/S/M/L/XL. This maxi dress is designed in luxurious satin-like material and features a mesh bodice for a sultry vibe. It's demure, yet daring at thea same time. The open back and the mesh sleeves further make a serious fashion statement. Perfect for dinner dates, wedding functions and formal functions.Also available in Navy / Black and in XS/S/M/L/XL. Every accent of this lace maxi feels luxurious. Lace and pleats make a perfect combination that one cannot resist. With the split leg details and the halter neck cutting, this stunning dress is a reflection of your sophisticated taste.Also available in Black / Lavender / Grey in XS/S/M/L/XL. Every accent of this lace maxi feels luxurious. Lace and pleats make a perfect combination that one cannot resist. With the split leg details and the halter neck cutting, this stunning dress is a reflection of your sophisticated taste.Also available in Lavender / Grey / Blush Pink in XS/S/M/L/XL. What’s your take on floral? 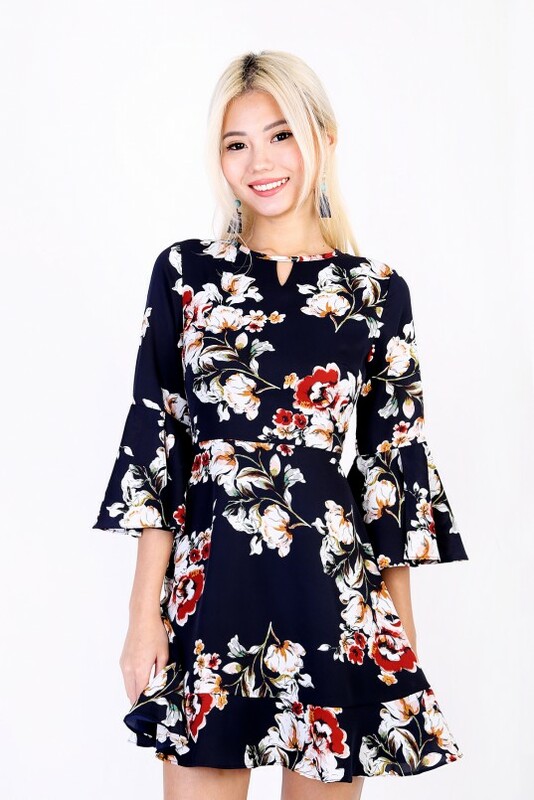 For date night or dance parties, this three quarter sleeved floral dress will be your best bet! With the fit-n-flare cut and the ruffled hem, this dress is a perfect fit. We heart this for sure!Also available in Cream/ Peach in XS/S/M/L/XL. Turn heads in the office in this pleated shift dress. Features accordion micro-pleats with contrasting colour palette. Don’t miss the details of the neckline – it’s ruffled!Also available in Navy in XS/S/M/L/XL. When the year comes to an end, we only have 2 things on our minds: Parties & Fun! Be best dressed at any party or gathering. This beautiful midi features a crochet halter bodice, along with a cascading mermaid hem. Made with a smooth finishing, this dress exudes both elegance and luxury. We love it and so will you!Also available in Navy in XS/S/M/L/XL.